The Epsom-based handler made history on September 10, 2016, by becoming the first woman to train the winner of the Ladbrokes St Leger. She achieved victory in the world’s oldest Classic via Harbour Law, a 30,000 guineas purchase who had been unraced as a two-year-old. He was her first runner in a Group 1 race. “To go down in history as the first woman to win it is amazing, at least I’ve done something right,” Mongan said. “We’ve felt all along that whatever he did today, he’d be even better next year. “I think I screamed a lot. I’m in shock. I’m so glad we came here and he’s proved that he can do it. Before the St Leger, Mongan had secured £207,997 in win prize money on the Flat since 2005. First prize at Doncaster was £396,970. Born on February 8, 1980, Mongan rode from an early age through the pony club and then competed in show jumping and eventing. She took out an amateur licence aged 16 while working for Epsom trainer Brooke Sanders. After 60 rides and five successes, she moved to Newmarket to work for Nick Littmoden, Sir Mark Prescott and Harvey Cyzer, then returned to Epsom to start training in 2004. She has enjoyed success under both codes, with her previous biggest victory coming in the 2013 Imperial Cup at Sandown Park with First Avenue. 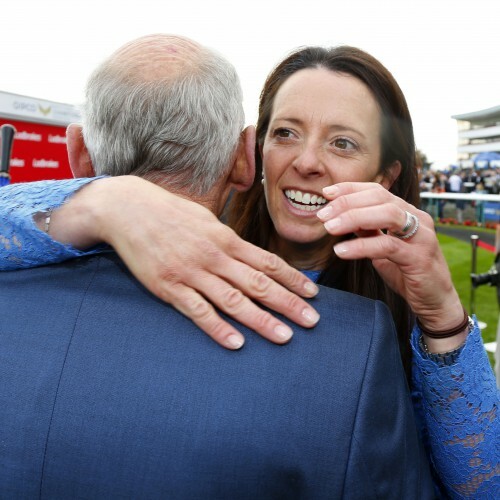 Her husband is former Flat jockey Ian Mongan, who retired from race riding in 2013 at the age of 34 because of weight issues after around 750 winners, including Twice Over, trained by Sir Henry Cecil, in the Group 1 Juddmonte International at York in 2011.